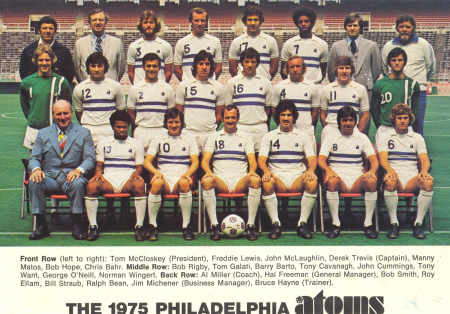 August 25th is the 40th anniversary of the Philadelphia Atoms’ NASL championship win over the Dallas Tornado. PSP is celebrating the Atoms and their historic inaugural season championship win with a series of articles in the run up to the anniversary. The series concludes with a look at what happened to the team after their championship and the team’s impact on American soccer. 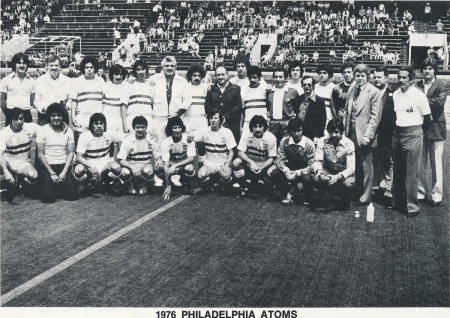 With a 2-nil win over Dallas Tornado in the 1973 North American Soccer League final, the Philadelphia Atoms had made history, becoming the first expansion team to win a league title in its first year of existence. While the league in question may have been a relatively minor pro circuit, the achievement was nevertheless stunning—notably, no previous NASL expansion team had turned the trick (although the New York Cosmos did win a title in their second year of existence in 1972). More important to sports fans in the city of Philadelphia, the Atoms had won a championship—period. The NASL title was the city’s first since the 76ers National Basketball Association title in 1967, and came at a time when all of the Philadelphia professional teams (save the Flyers) were coming off historically bad seasons. While perhaps only a coincidence, the Atoms’ title jump-started the city’s sports fortunes. The following spring, the Philadelphia Flyers would become the first National Hockey League expansion team to win the Stanley Cup, repeating the feat a year later. Within three years the Phillies would win the first of three consecutive National League East crowns, and would finally win a World Series in 1980. The 76ers rebounded from an abysmal 1973 season to get to the NBA finals by 1977, followed by appearances in 1980 and 1982 before finally winning it all in 1983. The Eagles’ climb to respectability took a little longer, but 1978 saw the first of four consecutive playoff appearances, including a loss in Super Bowl XV in 1981. Even other “minor” teams found success in the wake of the Atoms’ title—the Philadelphia Wings made it to the finals of the inaugural National Lacrosse League season in 1974, and the Billy Jean King-led Philadelphia Freedoms also made it to the finals in the first World Team Tennis season that same year. In 1973, the Philadelphia Atoms were the toast of the town. As Camden Courier-Post beat reporter Craig Evans wrote, “American soccer fans had some heroes, like [Bob] Rigby and [Bobby] Smith, whom they could instantly identify with.” Indeed, Atoms-mania had swept over youth soccer programs in Philadelphia and southern New Jersey, with clubs named “Atoms” and “Neutrons” popping up all over the place. The Atoms’ legend continued to grow in February 1974, when the team played an indoor exhibition against the touring Red Army of Moscow club. While this may appear to be just another friendly to younger readers, those of a certain age will remember what it was like in the 1970s and 1980s, when any game against a Soviet side was an extension of the Cold War—the 1972 Summit Series between the Soviet National Team and a team of NHL All-Stars is still the stuff of legend, the Soviet “theft” of the 1972 Olympic basketball gold medal over the U.S. team is still heavily debated, and everyone knows about the “Miracle On Ice” in the 1980 Winter Olympics at Lake Placid, when a group of American college kids defeated the Soviet juggernaut en route to the hockey gold medal. It was against this backdrop that the Atoms facing a Soviet team in a “new” game (indoor soccer) was big news. 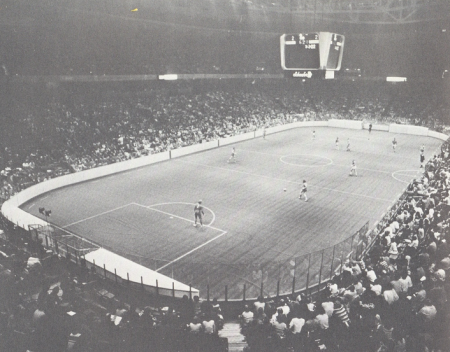 On February 11, the two teams met in Philadelphia at the Spectrum, with Astroturf covering the ice surface for the occasion. The curiosity factor of a “new” game, coupled with the ultra-competitive Cold War ambiance, led 11,790 fans to the arena that night. They were not disappointed: the Atoms held an early 1-0 lead, lost it, then kept rallying to tie until the score was 3-3 with about 17 minutes left to play. However, the locals faded and the Soviets hammered home three quick goals, giving them a 6-3 victory. The city’s love affair with the local booters continued into the 1974 NASL season. In the season opener against Washington, Andy Provan scored four goals in one half en route to an easy 5-1 victory. Two games later, the Atoms opened their home schedule before a record crowd of 24,093 in a 1-0 win over Denver. The Atoms cruised through the month of May, opening the season 5-1 and leading the Eastern Division. With Provan scoring six goals during that span, and Jim Fryatt adding another four, it appeared that Philadelphia would waltz to a second title. However, the Atoms’ scorers turned cold in the heat of the summer, and the team finished out of the playoffs. The fans continued to support the team, though—the Atoms averaged 11,784 fans per game in the club’s second season. Although struggling on the field, the Atoms remained committed to developing American talent: ten natives dotted the Philadelphia roster, four of whom were regular starters (Rigby, Smith, rookie Tom Galati and Barry Barto), with Bill Straub and forward Bobby Ludwig appearing regularly as second-half substitutes. All kidding aside, this begs a fair question: If the Philadelphia Atoms were so successful, and created a template that not only helped save the NASL but also provides a model still followed by MLS teams today, and had fan support at levels never before seen in the United States…well, where are they today? What happened? In many ways, the Atoms were the victims of their own successes. Great crowd support in Philadelphia, Seattle, Portland, Vancouver (and, not to be forgotten, San Jose) forced other NASL teams to raise their game. This culminated with the arrival of Pelé, signed by the New York Cosmos in June 1975. With the arrival of the Brazilian legend, it became clear that teams of British Third and Fourth Division players would no longer cut it in the NASL, and the Atoms had to make some changes if they wanted to again reach the postseason. Although team captain Derek Trevis returned in 1975, fan favorites Provan, Fryatt and Chris Dunleavy were not brought back. In their stead were experienced British professionals, all hailing from that league’s First Division (now known as the Premier League). From Birmingham City, the Atoms acquired defender Tony Want, and complimented him with another solid defender, Roy Ellam of Leeds United. In the midfield, another Birmingham City product, Bob Hope (not the comedian), was added, along with Liverpool veteran John McLaughlin (not the guitarist). Alas, it was also clear that it was harder for American kids to continue to play in the league. While the Atoms continued to feature Rigby, Smith, Barto and Galati in the lineup, popular local backups like Ludwig, Lew Meehl and Skip Roderick were shown the door. Unfortunately, this “experience” necessarily led to the severing of the ties that had made the team so popular in the city. In its haste to keep up with the changing NASL, the club had forgotten where it came from. “It worked in 1973 when the Atoms, in their first year, took the NASL championship. It was one of Philadelphia’s greatest Cinderella stories,” wrote the Courier-Post’s Evans at the time. “The names of Bob Rigby, Bob Smith, Andy Provan and Jim Fryatt became temporary folk heroes. Things were never the same [with the roster turnover].” This, coupled with the reemergence of the “major” sports teams in the city, resulted in the Atoms being pushed more and more on the back burner of the Philadelphia scene. Even with the exciting play of 1975 NASL rookie of the year Chris Bahr, son of American soccer great Walt Bahr, the bloom was off the Atoms. The team averaged only 6,848 a game while finishing out of the playoffs with a 10-12 record. But the worst was to come. Atoms owner Tom McCloskey realized his dream of owning an NFL franchise in 1974, acquiring the Tampa Bay team. Almost immediately, however, he returned the franchise to the league. Severely cash-strapped because of a bad business deal involving a skyscraper in Chicago, McCloskey could no longer afford the Atoms. By the end of the year, Rigby and Smith had been sold to the Cosmos, Trevis was released to become player-coach with San Diego, and most of the “folk heroes” from 1973 were long gone. Only Barry Barto, George O’Neill and Bill Straub remained. Whether they would have team to play for in 1976 was an open question—McCloskey put the club up for sale, and found no takers. It looked as if the NASL would have to fold the franchise. At the suggestion of Pelé, of all people, help came from the unlikeliest of sources. The United Clubs of Jalisco, a confederation of four sports clubs in Guadalajara, Mexico (including the club nicknamed “Chivas”), stepped in to purchase the franchise. What resulted was a proto-Chivas USA—Los Átomos became a predominantly Mexican side. O’Neill and Barto toiled alongside goalkeeper Rene Vizcaino, Pedro Harrada, and Belasario Lopez. Not surprisingly, Philly fans said “no, gracias,” and stayed away in droves. Only a little over 5,000 per game attended matches at the Atoms’ new home, Franklin Field. By the end of 1976, the club was placed in receivership by the NASL. The club was revived in 1978 under rock star ownership as the Philadelphia Fury, and featured many ex-Atoms. But it was not the same. Although the team was gone by 1976, the memories of that magical 1973 season continued to keep the Atoms in people’s hearts. With the arrival of Major League Soccer in 1996, there were constant discussions as to when the league would expand to Philadelphia and those discussions invariably referenced the Atoms. More the point, those references were never to “the Philadelphia Atoms, the city’s entry in the old North American Soccer League.” They were always to “Atoms”—no more needed to be said. Similarly, if an ex-Atom featured in the news, the reference was short and to the point. When Charlie Duccilli was hired to coach the New York Power in the Women’s United Soccer Association in 2002, the local reports did not read “Duccilli, who played for Philadelphia’s NASL entry in the 1970s.” He was referred to as “ex-Philadelphia Atom” Charlie Duccilli. Again, people remembered—and no more needed to be said. 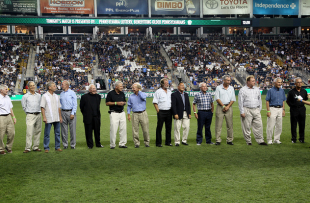 The Philadelphia Union honored the 1973 Atoms at halftime of the match against D.C. United on August 10. While the ceremony was not what it perhaps could have been—in all fairness to the Union, a soccer halftime (unlike halftimes in other sports where getting up at any time to get a beer or use the facilities is much more practical) does not lend itself to undivided crowd attention—it nevertheless generated a fairly enthusiastic response from the crowd that had stayed behind to watch. And over the past few weeks, we here at the Philly Soccer Page have also remembered. 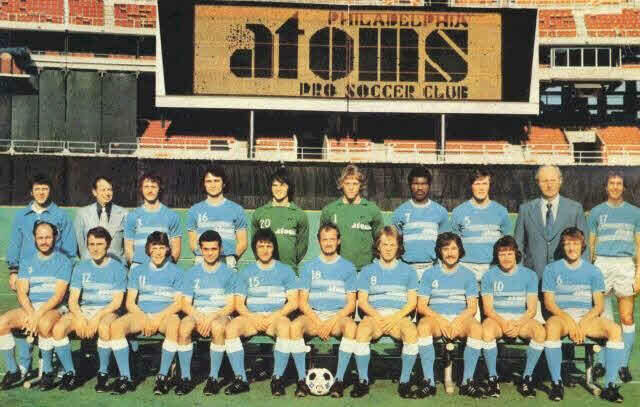 In doing so, we hope this series has given you a taste of how big the Atoms were on the Philadelphia sports scene, and how important they were to the growth of professional soccer in this country. Click here to link to the rest of the series and more articles on the Atoms. great coverage of the team and its legacy. i was too young to catch the atoms and still heard of them in the gulf between them and the union’s arrival. maybe the union can one day revisit the legacy and honor them properly like they did BSFC. Thanks for reading, Greg! Philadelphia’s soccer history is very important to us at PSP. Very nice series. I’m old enough to remember the NASL, but was a kid in another city following another side (Go Dips!). So I’ve enjoyed getting a new perspective on ‘the olden days’. Good stuff, and great series. I was only 3 when the Atoms won, though I do remember the Fury being around. Interest synopsis. I thing, though, that the Fury gets a lot of unfair bad press. I grew up in the 70s/80s, and traveled down I95 to the Vet on many a night/afternoon to watch the team. Some of the best memories of my childhood, dragging my skeptical, but willing, father along. Meeting Frank Worthington, and discussing his Elvis fascination, is still rooted in my memory. Pat Fidelia, too, was never given the attention he deserved…. At the time that the Chivas team in MLS was founded, I was astounded to not see any comparisons to the 1976 Atoms and their Mexican ownership. The similarities were striking. The on-the-field and at-the-gate results have been similar, too. Say, you got a nice forum post.Thanks Again. Keep writing. i went to a few atoms’ games in my youth. once fryatt and provan were unable to score, it was curtains. I went to a wedding and sat with Bob Ludwig in 2014. He talked about playing against Pele. Really amazing. 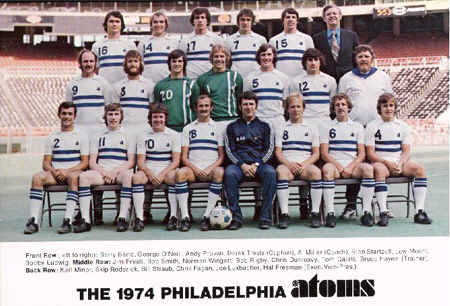 Why didnt they nam the MLS franchise the Atoms instead of the Union?